Pacific herring (Clupea pallasii) is a small, but hugely important fish to the ecology and the cultures of the Pacific coast. Fish, sea mammals, and birds rely on this fish and its eggs for food. For thousands of years, this once abundant fish has been central to the social, cultural, and economic relations of coastal indigenous communities. Since the late 19th century and continuing into recent decades, industrial fishing of herring has helped support many communities across the Northwest Coast. Recently, like many small fish around the world, herring numbers are dramatically reduced, especially compared to levels seen in the mid 20th century. These declines have widespread ecological, cultural, and economic impacts that of are concern to people throughout the region. Herring move throughout the ocean in large schools that can reach several kilometers in length. In spring, adult herring congregate along the shores to spawn. The larvae and juveniles spend their first summer near the shore and in shallower bays. In the fall, these juveniles move into deeper water and in 2 to 3 years, join the populations of adult herring. At each stage in their life cycle, Pacific herring are a key component of coastal ecosystems and support a web of life on sea and land. While herring themselves feed on phyto- and zooplankton, the various life-stages of herring are a rich and abundant food for many land and sea creatures. In the ocean herring and their eggs are consumed by invertebrates, fish, birds and marine mammals. On land, a variety of animals feed on herring, including black bears, wolves, mink, eagles, and other birds – and of course, humans. To learn more about herring ecology, check out Explore. There are many populations of Pacific herring throughout the North Pacific Ocean and adjacent seas. In the western North Pacific, they are found throughout the Western Bering Sea to Kamchatka, in the Sea of Okhotsk, around Hokkaido, Japan, and south and west to the Yellow Sea. In the eastern North Pacific Ocean, herring range from Baja California, Mexico, north to the Beaufort Sea, Alaska. Pacific herring are also found in the Russian Arctic from the Chukchi Sea to the White Sea. Although people agree that herring, like most small fish, tend to be naturally abundant, there is less agreement about how herring numbers are distributed over time and space. Many people understand that herring numbers fluctuate over the years, but there is little consensus about the degree of fluctuation, the multi-year averages, and if some areas are consistently abundant while others fluctuate through time. Furthermore, the historical and archaeological records suggest herring was more abundant in the distant past than in recent decades. 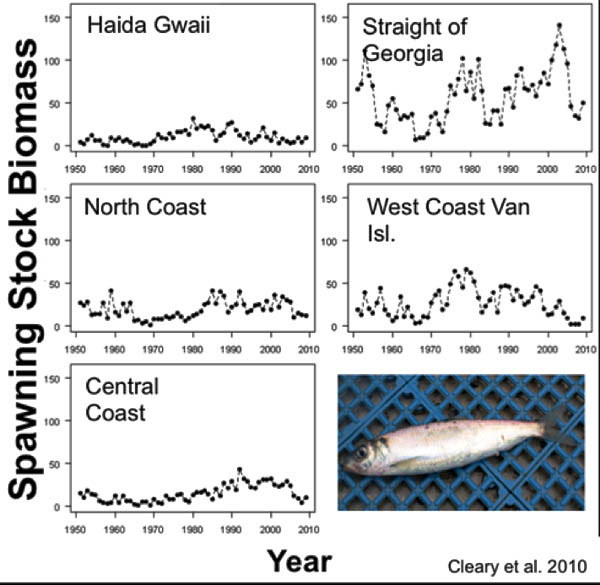 The status and trends of Pacific herring stocks are tracked through commercial catch numbers, estimated spawning biomass, and economic effects (landed value). Methods include aerial surveys of spawning areas, test fishery to determine the ripeness of the stock, acoustic sounding techniques from test boats, and targeted dive surveys to verify spawning intensity and quality. For many First Nations and Native Americans from Alaska to Washington, the nutritionally valuable and readily harvested herring and its roe were integral to daily lives and worldviews. This is reflected in photographs, interviews, oral histories, and indigenous place names. Many coastal groups maintained family-owned locations for harvesting herring and herring roe from anchored kelp fronds, eelgrass, or boughs of hemlock or cedar trees. Herring was harvested at other times of the year than the spawning period when massing in local waters, but many historic observations identify late winter and springtime spawning as a key period of harvest for both roe and fish. Processed herring and roe were consumed in large quantities and traded widely among coastal First Nations. Since the 1970s, licenses and legal judgments have been issued to First Nations in Canada, Native Americans in Washington, and Alaskan Natives that support food, social, and ceremonial fisheries, and in some cases commercial fishing. Many First Nation communities have traditional stories and songs about Pacific herring. These stories have been passed down across generations and reflect the long-term connection of indigenous peoples to land- and sea-scapes. Pacific herring have been fished at an industrial scale since the 19th century. Fishing technology changed over time, related to shifts in herring “products” needed to supply changing market demands. Since the early 1970’s, herring have been primarily caught for its roe, which is shipped to Japan in large quantities. In Japan, “kazunoko” is a traditional delicacy, which is sold at relatively high prices. Most recently, the demand for herring roe in Japan is declining due to changing consumer preferences. Herring is also caught for bait and food. Threats to north west coast herring populations are manifold. 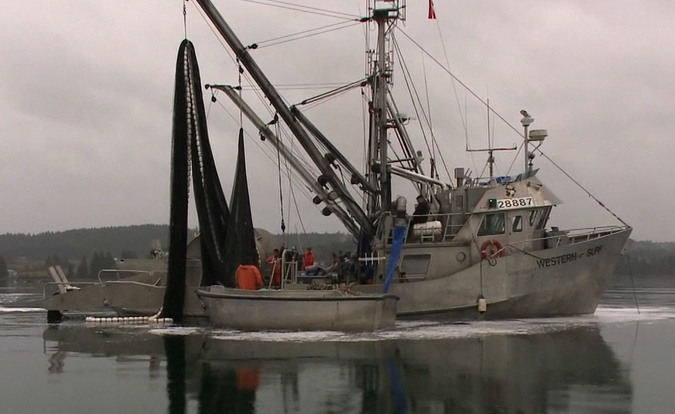 A threat to Pacific herring is the loss of spawning grounds. This habitat has been degraded or destroyed by dredging, construction activities, log storage, and decreases in water quality. Especially oil spills can have a desastrous impact on spawning grounds as the Exxon Valdez spill has shown. Global warming may also pose a threat to the species by reducing the availability of their prey; zooplankton and phytoplankton. In addition, the recovery of populations of predator species, such as humpback whales and sea lions create pressure on herring populations. While the commercial fishery is not threatening the species as a whole, high fishing pressure on local stocks can change population strucutre and recruitment success of those populations. For thousands of years, Aboriginal people living along the Pacific coast have had systems for managing herring stocks in their traditional territories. 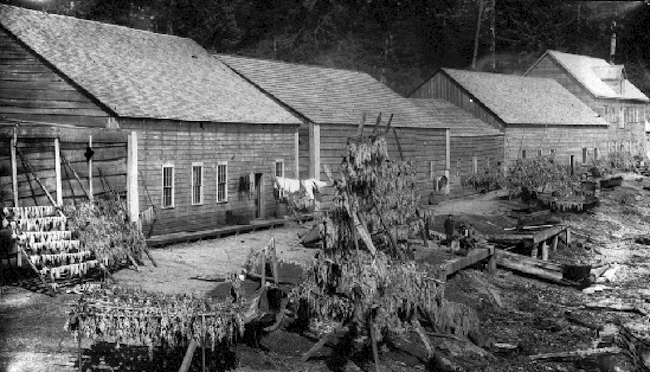 By the late 1800’s, state-sanctioned management systems, such as the Alaska Department of Fish and Game (ADFG), the Department of Fisheries and Oceans Canada (DFO), and the Washington Department of Fish and Wildlife (WDFW) were the dominant decision makers on the Pacific coast, responsible for the management of Pacific herring and other fisheries stocks. By the late 1900’s, court cases such as US v. Washington  (the “Boldt Decision”), R. v. Sparrow , R. v. Gladstone , and R. v. Delgamuukw  recognized Aboriginal Rights and Title and made it mandatory for the state-sanctioned management systems to consult with First Nations regarding fisheries management strategies. Following the Boldt Decision, WDFW share joint-control and decision making power with Aboriginal people through co-management of the herring fisheries. In Canada, DFO is pursuing collaborative strategies through its harvest advisory processes, Aboriginal fisheries initiatives, and integrated oceans management; co-management with First Nations is viewed as a major component of Pacific fisheries reform. 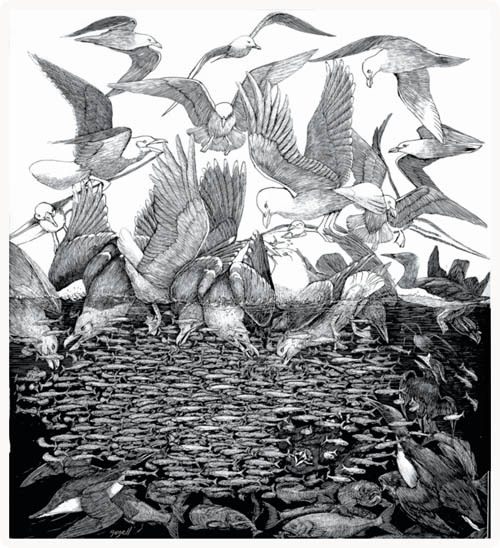 ADFG remains the primary decision-making power for the herring fishery in Alaska. Governance issues surrounding herring are situated within larger issues surrounding the governance of all traditionally harvested resources. Many First Nations assert that they have authority to harvest a fair share of resources from -- and be meaningfully involved with management decisions of relevance to -- their traditional land-sea territories. This assertion stems from their longstanding occupation and use of the land and sea, and from continuity in Indigenous management systems overseen by hereditary chiefs and other community leaders. On the other hand, governments assert their authority through legal and political structures that have been evolving since the arrival of Europeans. In Western Canada, Provincial and Federal Governments did not recognize the territorial authority and interests of First Nations; this is why treaties were not historically pursued and why questions and heated debate about the recognition and implementation of First Nations rights and title to land-sea spaces and resources, including herring, continue today. However, the Canadian constitution recognizes that First Nations, Inuit, and Métis people have unique rights grounded in their longstanding use and occupation of the land and sea. Consequently, the courts continue to affirm specific harvest, commercial and management rights to First Nations, Inuit, and Métis on a case-by-case basis. When we discuss pressures on herring, it is important to distinguish between reasons for the current decline in numbers and size and the reasons for the lack of recovery. When it comes to recovery, there are places that have been closed to a commercial herring fishery for several years, but where stocks have failed to come back despite the release from fishing pressure. Possible reasons for a lack of recovery include, 1) changes in ocean temperature which in turn may cause an increase in predators (e.g., hake) or a decline in food for herring (zooplankton), 2) the elimination of older fish from the population that held the “social knowledge” about where to spawn, 3) increases in predators such as whales, sea lions, and seals, and 4) increases in competitors who share the same prey resource like anchovies and sardine. Similarly, while most people recognize that Pacific herring numbers are in decline in many parts of its range, there is little consensus about the causes of these declines. Many coastal Indigenous peoples and other local fishers, based on personal observations and traditional knowledge, hypothesize that local herring stocks have been dramatically reduced in numbers and size and made more difficult to access following 20th century industrial fishing. Fisheries managers identify commercial fishing as only one of several potential causes for the coast-wide decline in herring and lack of recovery since implementing conservation measures. In the Strait of Georgia (British Columbia), some managers hypothesize that populations have in fact not been depleted, but rather have shifted spatially because of climatic factors and increases in predator abundance. Many First Nations have also identified changes in ocean temperatures, predators, and competitors as additional causes for herring declines. Still other people suggest that in some places habitat loss due to alteration of the foreshore is the most significant threat to herring numbers. The Hakai Network’s “Herring School” is a collaboration of researchers from Simon Fraser University and other universities, and First Nations communities who are keenly interested in the cultural and ecological importance of herring. By combining traditional and western knowledge from diverse communities, the Herring School seeks to address key questions about herring in the northwest Pacific about the past, present and future situation of herring stocks and how they can be managed sustainably. This website is a product of our efforts to share the herring story with the public and to illustrate why herring has been so important for our coast and to further an exchange and collaboration between traditional knowledge holders, scientists, managers, and the public. We gratefully acknowledge the many teachings that were shared with us in the making of this web site.